I’m just getting home from a gorgeous weekend in Minnesota. Even though we were only there momentarily, every time I’m there, it reminds me of how much of my childhood can be found in the places I’ve been before. Tony and I walked around Lake Calhoun (a popular Minnesota lake) and it took me back to when I was around 9 or 10; my mom used to bring me along 20 mile bikes along the different paths that connected the Minnesotan lakes. We had the best times together cruising around the city in search for an always different outdoor adventure. In fact, we did everything together. Just us two girls. We’d make breakfast, bake pies, do crafts, shop at the hispanic market, go on long summer bike rides, take workout classes, go to movies, etc. Safe to say, I’m really missing her. Why I’m talking about all this is because I love cooking for my mom and she no longer lives close to me. Life is busy and each month comes and goes with the blink of an eye, but it made me realize how there’s always going to be an excuse NOT to do something. And since my mom is one of the most important things in my life, I need to make seeing her a priority. In case you haven’t noticed, my mom has inspired many recipes on this site; her love of cooking and flavor creativity is as strong as mine. When I first started my blog, I was living at home after college and packing all of my mom’s lunches and planning our dinners. She was my taste tester and allowing me to meal prep and cook always meant that we had healthy meals available. We’d make huge batches of chili with corn muffins, strawberry banana quesadillas for breakfast, skinny banana muffins and her personal favorite: butternut squash black bean enchiladas skillet. Another favorite of hers? My always different, yet delicious and healthy quinoa salads. 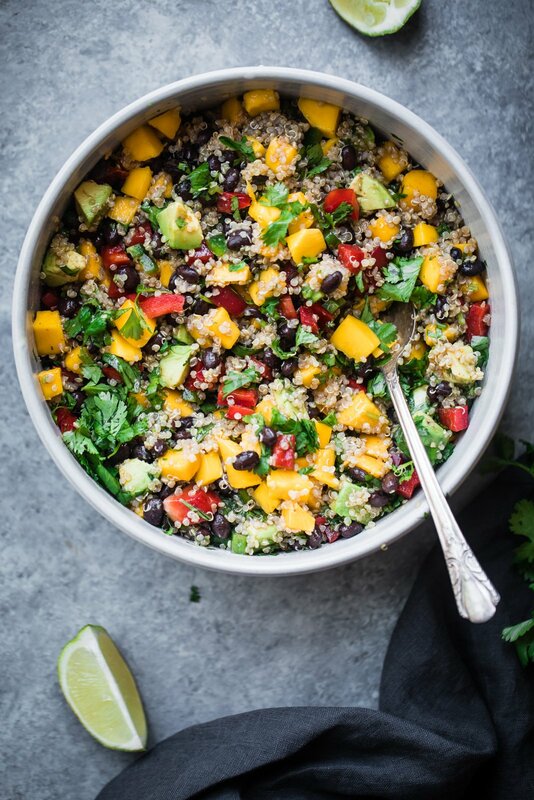 This mango black bean quinoa salad is a recipe I know my mom would just adore. It’s simple, beautiful, seasonal and stays good for days. It tastes like a little fiesta in your mouth and yes Mom, I made it just for you. 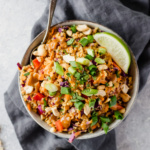 It’s vegetarian, healthy and perfect for packing for lunches. Mango. It’s sweet and juicy this time of year! Black beans. Adds protein and fiber. Avocado. Healthy fats for the win. Red bell pepper. Adds the perfect amount of crunch. Cilantro. Because cilantro is LIFE & SO FRESH. 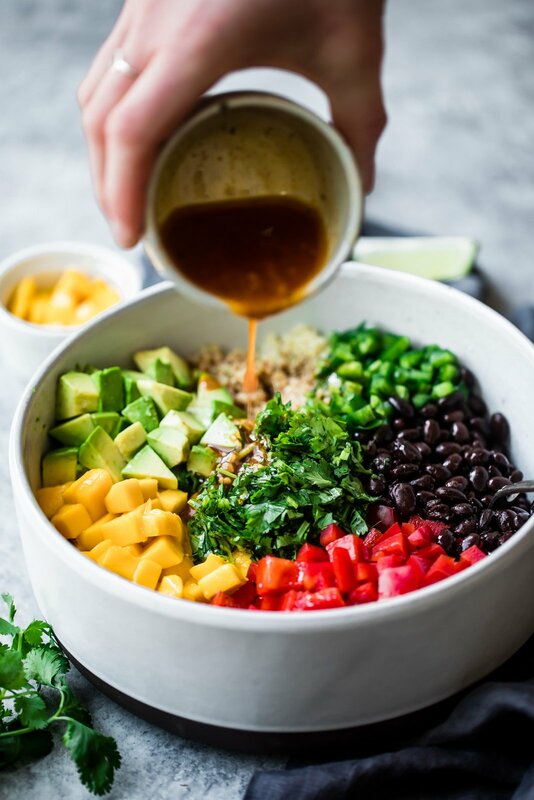 Honey Lime Chipotle Dressing: this dressing is everything and SO easy to make! It’s just a mixture of a little lime juice, olive oil, honey, garlic, dijon, chipotle chile powder, salt and pepper. You’re going to love it. 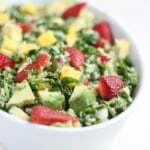 I hope you give this salad a try; it’s great to bring to summer parties and if you’re worried about the avocado getting brown, I suggest adding it right before serving. I didn’t have an issue with it browning though (I think the lime in the dressing helped prevent it). Both Abra and I loved this gorgeous salad very, very much and both exclaimed how much we loved the flavor combination and various textures. We think you’ll love it too. ENJOY! 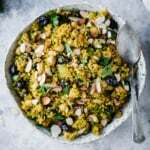 Add water and quinoa to a medium pot and place over high heat; bring mixture to a boil, then cover, reduce heat to low and cook for exactly 15 minutes. After 15 minutes, remove pot from heat and fluff quinoa with a fork. While the quinoa is cooking, chop all your fruits & veggies. Once done, add them to a large bowl along with your cooked quinoa. 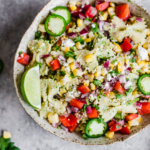 In a separate small bowl, whisk together the ingredients for the dressing: olive oil, fresh lime juice, honey, dijon, chipotle chili powder, garlic, salt and pepper. Pour dressing all over the quinoa salad and toss to combine. Garnish with extra cilantro and pepitas if you’d like. Serve at room temp or cold. Salad with stay good for 4-5 days in the fridge. Serves 4. TO MAKE VEGAN: Use maple syrup or coconut palm syrup instead of honey in the dressing. If you make this recipe, be sure to tag #ambitiouskitchen on Instagram. 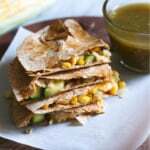 You can also leave a comment and rate the recipe below so other readers know how you liked it. xo! 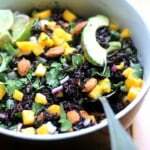 41 Responses to "Fiesta Mango Black Bean Quinoa Salad"
I agree with the mango! A little bit of sweet! I made this salad last night for dinner. It was so delicious!! I can’t say enough good things about this recipe. My husband was very skeptical about it satisfying his hunger but he was pleasantly surprised and didn’t even need to go back for seconds. The only thing I changed was using a bag of quinoa/basmati rice blend instead of the quinoa because that is what I had in the pantry. I will be making this one all summer long. A few weeks ago I tried the sweet potato avocado brownies. 5 stars all around. Even our grandchildren loved them. Absolutely!! Glad you loved it. I can’t wait to try this, been looking for a fresh summer salad that’s vegan! She’s correct that that each serving is 415? Or that all servings add up to 415? Sorry, got confused. Either way will be making! What can I sub for mango? Not really a fan of it. You can leave it out or maybe use peaches! Wow the flavors are so perfect and refreshingly different from other similar quinoa salads I have made. This recipe makes me very happy, thank you! This sounds so good – I am on a NO sugar diet – stevia or Xylitol – anyone ever try it instead of honey??? It’s delicious! I haven’t tried it with those – they might change the flavor and/or consistency a bit here. 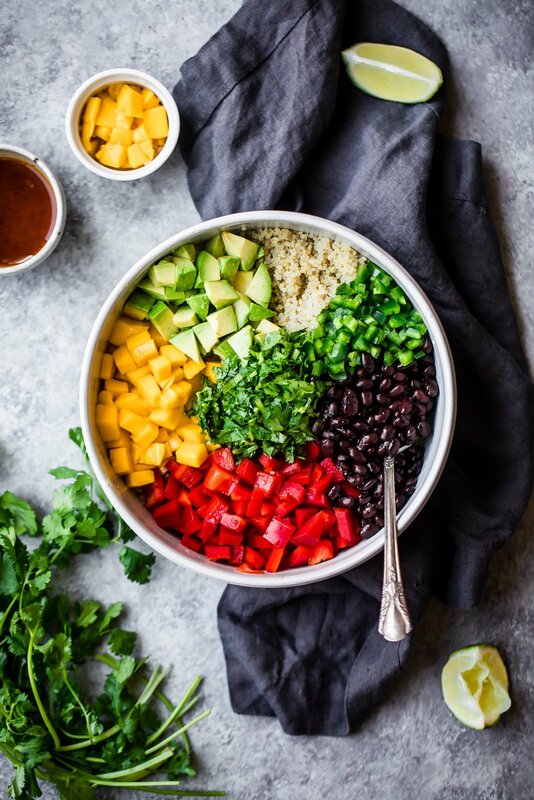 I have made this, without the avocado or mango –yet– I got it started to serve tomorrow. i added some baby cucumber and wow, it’s already amazing. I will add the other ingredients tomorrow just wanted to say Thanks, this is a fantastic recipe! I will be making this often. It’s the dressing that puts this over the top! I switched to orange juice instead of lime to carry the sweet flavor. I also added crushed tortilla chips. Now I have a party in a bowl every day at work! This is great – thank you! My family loved. This. Salad. I have a feeling requests will be in for this at least once a week for the forsee able future. Sadly I am the only mango lover in the house so I tried subbing some cubed watermelon and that worked great! I made this for dinner tonight. Perfect dish for a hot,Texas summer! 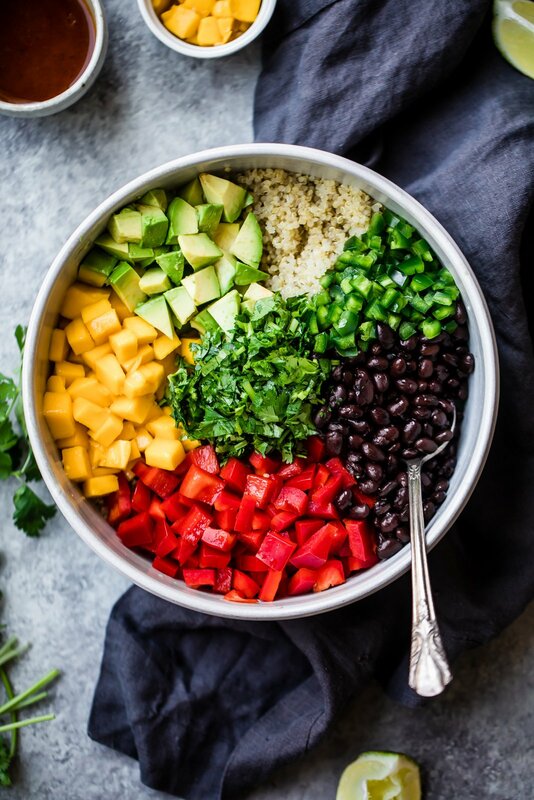 Light, fresh, flavorful, colorful and delicious!! So glad you liked it! The BEST on a hot summer day. Hi if you don’t have have the chipotle chilli powder what can you use instead? This was an amazing recipe!!!! My family loved it! The seasonings and combination was perfect! This is my new favorite salad – amazing flavors!!! 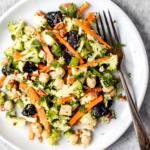 This salad is the perfect combination of flavors and nutritious elements. I do it often and my family love it. Absolutely. Glad you and the whole family love it!